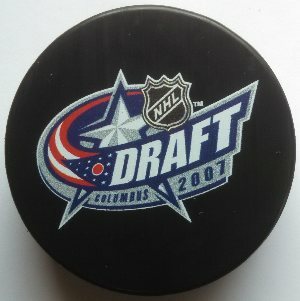 The 2007 NHL Entry Draft was the 45th NHL Entry Draft. It was hosted at Nationwide Arena in the city of Columbus, Ohio on June 22, 2007. Click on the link above for the complete list. Made by In Glas Co. NOTE: Prices shown are for less than 12 total pucks. Discounts are: 12-49 pucks @ $3.75 ea. / 50-99 pucks @ $3.40 ea. / 100+ pucks @ $3.15 ea.